I think I’ve said this many times before, but I don’t care: I like pixel art. I played the NES, SNES, and the Gameboy for a good majority of my childhood. These giant blocks of color make for some interesting design choices and interpretations of familiar objects. 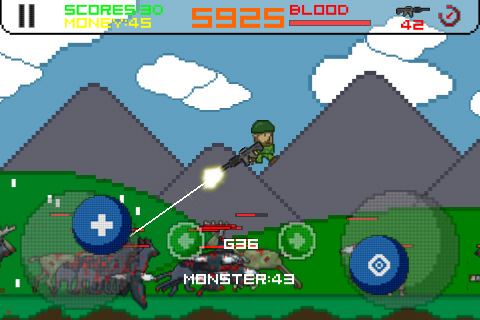 Monster Fire takes the pixel art, blends it into a side-scrolling shooter where you play as a soldier jumping and evading zombies, robots, and Godzilla. Oh my gosh, it’s Godzilla! Awesome!! Monster Fire is brought to us by Yan Zhenhua on the iPhone, iPod touch, and iPad for $0.99 and there is a Lite version available. Graphically, they really stick to the pixel art style. User interface, text, and all the characters are done in this style and graphically, there are some inconsistencies. Some enemies are really deformed, unshadowed, and graphically lacking. Meanwhile, you have Godzilla, extremely well detailed, shadowed, and shoots 3D atomic breathes. Sound effects are actually not bad. There are some annoyances with the gun shots, but that’s something you can say about any shooter. It does get annoying though when you choose to upgrade your character’s health rather than his guns. Gameplay involves jumping constantly while moving left and right to evade enemies while constantly aiming diagonally to fire at the enemies that constantly swarm towards you and damage you on touch. As levels progress, they get faster, cheaper, and more difficult to evade. After a few minutes, it does become brainless since it’s nearly impossible evade the damage and your pistol, being the weakest weapon you have, has unlimited ammo, so you are pretty much guaranteed to run out of bullets from all your other more powerful weapons. There are 3 modes of jumping constantly: Adventure Mode, Survival Mode, and Dodge Mode. Adventure takes you on a journey through zombies, hordes of deer, birds, and boss battles. Survival pits you in in pretty much Adventure mode, but you cannot upgrade your character or weapons, though at the end of each level, you refill on ammo and health. 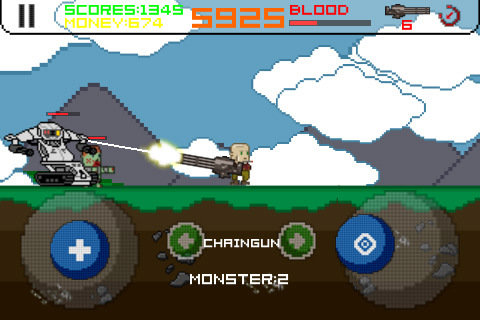 Dodge mode disables your gun and forces you to jump over enemies that now run around the stage randomly. Controls are alright, though when you play Dodge mode, you cannot jump by moving the joystick upwards like in Adventure and Survival mode. Instead, you get a jump button that doesn’t respond very well. I had to mash the thing as much as possible because when it comes to a last-second jump, it is too unreliable. Just jump randomly again. Dodge mode actually confuses me since it was more fun than the other modes because the enemies don’t cluster together and follow your every move. I would have preferred Dodge Mode’s enemy AI combined with Adventure mode’s controls and upgrade screens. So in the end, Monster Fire was only an average game. Even with Godzilla, there is only one mode that is remotely fun and you can’t attack during that mode. Graphically, your main character’s head and arms are almost never logical. Your head always faces the direction he is going so a lot of the time, you’ll see your character running away from your enemies while firing blindly behind them. Monster Fire wasn’t able to stand up to Godzilla’s awesome might, but again, it’s only version 1.1, so let’s give them some time to improve. AppSafari review of Monster Fire was written by Joseph Ho on October 31st, 2010 and categorized under App Store, Games, Scrolling Shooter. Page viewed 3514 times, 2 so far today. Need help on using these apps? Please read the Help Page.